I am not sure what directions come with the download of Animation-Ish. I created these screen shots with the hope of helping people who might be struggling to create an animation. Wiggledoodle-Ish: The first level is pretty much self-explanatory. It is a very simple three step animation. 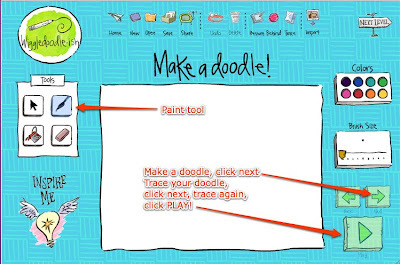 Make a doodle, click the next button, trace it, click next, trace it a third time and hit Play. Level Two: Flipbook-Ish has controls that are similar to Wiggledoodle-Ish. In this level the user can create as many frames as they desire. 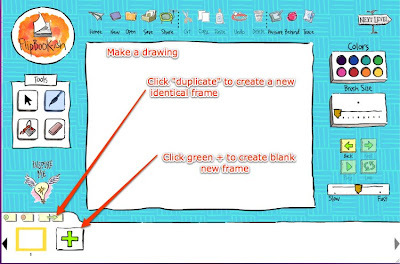 Click on the green plus sign for a new blank frame or click on the duplicate button to create an exact copy. When I first started animation, I used the duplicate button a lot and then moved items in the frame a little. Level Three: Advanced-Ish adds the possibility of a background layer. It operates much the same as the foreground layer. 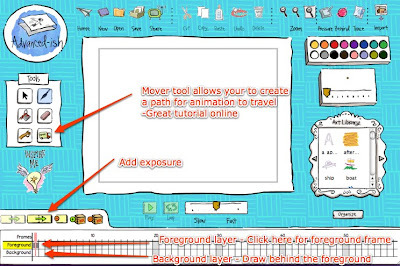 There is a mover tool in this level and there is an excellent tutorial on using that feature in the "Lessons" section of the website.